Lenovo's new T400s laptop aims for the sweet spot between portability and performance, offering up a whole bevy of options in a device with a 14.1-inch screen that weighs under four pounds. The T400s is essentially a cross between the bulkier T400 and the super-slim X300. It's got business-dude-friendly features like a dock connector on the bottom, a fingerprint scanner that can boot into your login with a single swipe and components that are easy to upgrade. It's also rugged as hell, as you can see in this video. It's available now starting at $1,599, but that price goes up fast when you stick in stuff like 8GB of RAM or a Blu-ray drive. Inspired by Lenovo's thinnest and lightest full-function laptop, the featherweight ThinkPad X300, Lenovo engineered its latest laptop to be super-slim at just 0.83 inches thin and ultra-light starting at under four pounds1. The laptop achieves its skinny frame thanks to the thin 14.1-inch LED screen, solid state drive storage and the second generation Top Cover Roll Cage, which Lenovo first introduced in the ThinkPad X300 laptop. The roll cage's monocoque carbon reinforced fiber, also used in bicycle frames and airplanes, helps keep the laptop extremely light yet surprisingly sturdy. With this design the laptop weighs nearly 20 percent less than its ThinkPad T400 predecessor, making it much thinner and lighter than the Dell E6400 and HP 6930P laptops. Because more people are using voice over IP (VOIP) for communicating at the office, at home or on the road, Lenovo optimized its latest laptop to make VOIP calls simple. There are three main ingredients for a high quality VOIP experience – the quality of the video, the quality of the audio and the quality of the network connection. For a great VOIP experience, Lenovo equipped the laptop with a two megapixel camera for better quality images and to help in low lighting conditions. Lenovo also pumped up the speaker volume more than two times greater than audio levels on the ThinkPad T400 laptop and added a convenient toggle switch at the top of the keyboard to easily increase and decrease volume. A similar feature can be found on the steering wheel of sports cars. Finally, Lenovo's range of connectivity options give uses flexibility in how they want to connect online. 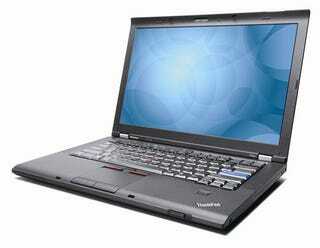 The ThinkPad T400 laptop is available beginning immediately through Lenovo business partners and www.lenovo.com. Models start at approximately $1,599.